Good news: Microsoft's Xbox Live online service is going to undergo some noteworthy changes for the Xbox One, and will do away with at least one of the current system's more annoying limitations. If you've ever tried to play a "Games for Windows Live" PC game while your roommate watches Netflix on your Xbox 360, you know how irritating Microsoft's current Xbox Live restrictions can be. One minute, you're firing up Dark Souls or Batman: Arkham City while your roommate tries to fire up an episode of Buffy in the living room. The next, you've logged into your game, but your Xbox 360 has been forcefully logged out. Frustrated cries come from the living room. Microsoft PR: "You may be logged into Games for Windows Live and an Xbox One console simultaneously." Games for Windows Live is Microsoft's online PC gaming service, which doubles as DRM for all GFWL-required games. (Full list here.) GFWL is unpopular among PC gamers for a number of reasons, and the single-login requirement is a particularly annoying limitation. Basically, you can only be logged into your account from one place: If you log in on your PC, you'll get kicked from your Xbox session. It can be inconsistent in practice, and there are a few workarounds—some PC games work fine in offline mode, and some Xbox apps will keep running even if you're logged out mid-stream. But generally, it's a headache. Today, Microsoft detailed a number of the ways that the Xbox One's premium online service Xbox Live Gold will be different. (If you don't want to pay for Gold, you can still get some basic services for free through Xbox Live Silver.) 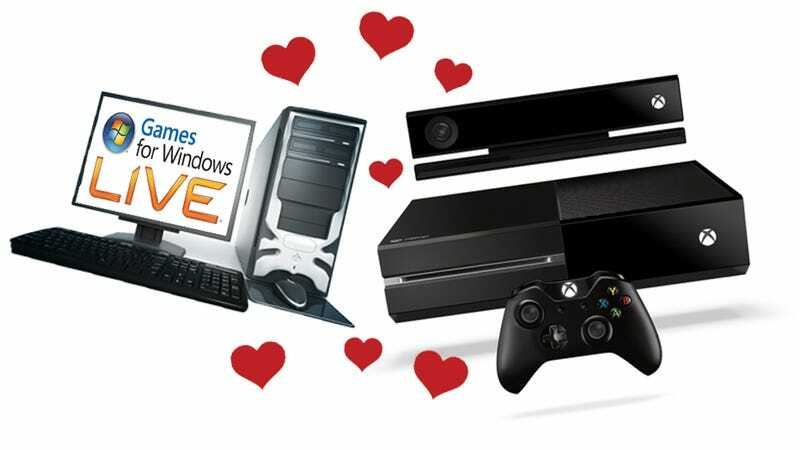 We reached out to ask about Games for Windows Live: Will PC games and the Xbox One play nice? "You may be logged into Games for Windows Live and an Xbox One console simultaneously," a Microsoft spokesperson told Kotaku today. So, if a game must come saddled with Games for Windows Live, at least it won't also screw up your Xbox One connectivity. Microsoft has already briefly mentioned that you can assign your Gold account to your "home" Xbox One, letting anyone who uses it access your Gold features, even if they use a different login. Furthermore, you can access your own Gold features remotely by logging in to any other Xbox One. At E3 this year, we briefly highlighted a new benefit we’re bringing to Xbox Live Gold members on Xbox One. We’re calling it Home Gold. It will enable any Xbox Live Gold member on Xbox One to extend many Gold features to others at no additional cost. One Xbox Live Gold account delivering great benefits to everyone in the home. At home. You can set up your console at home so that anyone who uses that console will enjoy multiplayer gaming and access to entertainment apps – even if you are not home or logged in. On the go. You can log in at a friend’s house and everyone there can enjoy multiplayer gaming and access to entertainment apps while you are logged in. That sounds pretty cool, but at least one question still remains: If you log in at your friend's house while someone at home is watching Netflix, will their session get booted? Microsoft's spokesperson confirmed that won't be the case. "Gold features will stay active on your home Xbox One console even if you roam and login to use your Gold features elsewhere," the spokesperson said. Well then! Those sorts of small annoyances could have really worked against the idea of a single console as an all-in-one home entertainment box. While it remains to be seen just how all that will work in practice, it's good to hear that Microsoft is making some smarter decisions this time around.